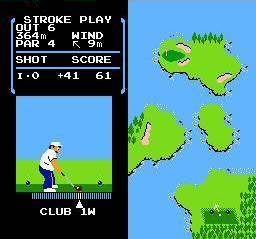 Golf is a sports game that was released as part of the NES Black Box series. A total of 18 holes are available that can be played in either a 1-2 player Stroke mode (lowest score overall wins), or a 2 player Match mode (points are awarded for each hole). To hit the ball, you press A to start a metre, again to stop it at your desired power, and then once more as it moves in the opposite direction towards a white line, signifying the sweet spot; missing this sweet spot will cause the ball to curve to the left or right, but Super Shots can be activated if you achieve top power and perfect accuracy when using a 1 Wood. The swing metre is very innovative (given it's still being used in modern golf games!) and I like how each club has it's own sweet spot that expands as you move from the Woods into the Irons. The metre moves surprisingly quickly, but the main problem is trying to line up a shot, as the directional arrow only moves in increments rather than in a fluid motion. In fairness, this does force you to learn how to hook and slice shots, but it's still annoying! The biggest issue though is the lack of in-game stats regarding club power and remaining distance to the pin; this means you have to either guess, or constantly refer to the manual which detracts from the immersion. Putting fares no better, as despite visible arrows to signify breaks, there's nothing to show the severity. The course design is average, with all the standard features you'd expect, but no surprises or imagination; it's purely functional rather than focussing on fun. The only mildly interesting course is Hole 6 due to its multitude of islands. While the double camera view is neat during gameplay, the action is lifeless due to the complete lack of audio and SFX from the time you turn on the game to taking your first shot! Golf isn't as pick-up-and-play as other games in the genre due to its quirky controls and lack of in-game statistics. It also has none of the usual Nintendo charm or encouragement while you play, and overall it's just a really dull, soulless golf game that takes far too much time to adjust to. Random trivia: Nine holes in the Wii Sports (2006, Nintendo Wii) golf mini-game were 3D recreations from this NES title.